Buffalo resident Jonathan Bottoms celebrates after crossing the finish line inside Selby Stadium during Sunday’s IRONMAN 70.3 Ohio. Buffalo’s Jonathan Bottoms woke up before the sun, swam 1.2 miles at Delaware State Park beach, rode his bike through Delaware and Marion counties for 56 more and ran 13.1 miles … all before lunch. And he wasn’t alone. The nearly 1,800 other triathletes who competed in Sunday’s second annual IRONMAN 70.3 Ohio did the same. Bottoms was the first to cross the finish line, wrapping up the race in 4:22:24. That’s a pace of 7:04 minutes per mile. He was first among the 187 entrants in his age group (40-44) and fourth among the 1,797 triathletes in action. He hopped on his bike next. That’s where he really made his move. “The bike, it was fast,” he said. “I really dropped the hammer on the bike. It felt really good … I’m crushing the bike right now. Bottoms, who said he’s competed in at least a dozen IRONMAN 70.3 events and about half as many full IRONMAN races, finished the swim in 29:54, the bike in 2:14:18 and the run in 1:33:39. 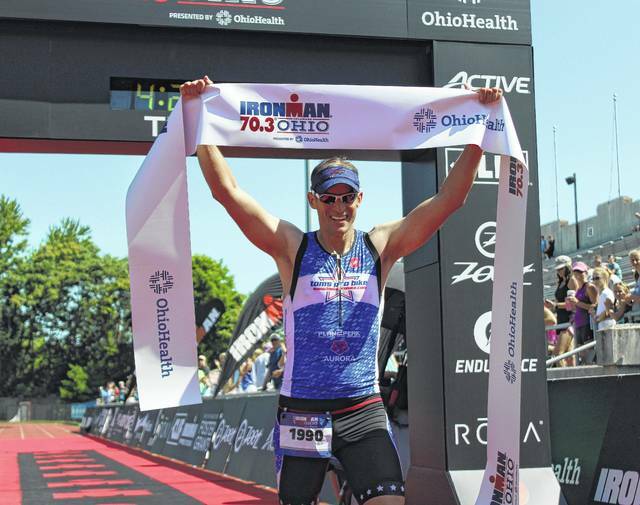 He took just 2:48 to transition from the swim to the biking part of the competition, and 1:47 transitioning from the bike to the run, which wrapped up on the track of historic Selby Stadium on the campus of Ohio Wesleyan University. Michael Vulanich, from San Francisco, finished with the top overall time (4:06:08). He competed in the men’s 30-34 age group. Peggy Yetman, competing in the women’s 45-49 division, was the fastest woman in action, closing in 4:30:00. Her time was good enough to earn her 12th place overall.